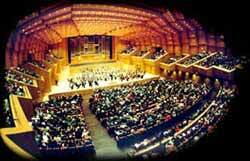 Three grand productions form the unit Great Opera Productions at the Athens Concert Hall for the 2003-2004 period. Starting from I Vespri Siciliani by Giuseppe Verdi on October 2003, then follows Arthur Honegger's Jeanne au Bucher. The marvellous Traviata by Verdi comes on May, directed by Ulrich Peter. October 10, 11, 13, 14, 16, 17, 19, 20, 22 (2003) Giuseppe Verdi: I Vespri Siciliani Stage concept, sets, costumes: Nikos Petropoulos Stage director: Rodolfo Craia Roles interpreted by: Elena: Susan Neves, Eliane Coelho, Arrigo: Janez Lotric, Keith Ikaia Purdy, Monforte: Vladimir Chernov, Alexandru Agache, James Johnson, Procida: Francesco Ellero d'Artegna, Paata Burchuladze. The Athens State Orchestra participates conducted by Donato Renzetti. February 26, 27 (2004) Arthur Honegger: Jeanne au Bucher (Dramatised Oratorio) Director: Thomas Moschopoulos Sets: Dionysis Fotopoulos Nonika Galinea interpretes the main role. The Athens State Orchestra participates conducted by Nikos Tsouchlos. May 10, 11, 13, 14, 16, 17 (2004) Giuseppe Verdi: La Traviata Director: Ulrich Peter Sets - Costumes: Nikos Georgiadis Roles interpreted by: Violetta: Ruth Ann Swenson, Inga Nielsen, Alfredo: Charles Castronovo, Piotr Beczala, Germont: Jean-Luc Chaignaud. The Athens State Orchestra participates conducted by Richard Bonynge. Athens Concert Hall The inspiration for a multifunctional culture centre can be traced back to the renowned soprano Alexandra Triandi, who founded the the Friends of Music Society. The society then commissioned some top Greek and foreign architects and sound experts to design the Athens Concert Hall. In 1956 the Greek government donated a site for its construction. It should be noted that the first monies towards erecting the building came from Dimitris Mitropoulos, who donated the proceeds from the New York Philharmonic's Athens recitals, which he conducted. The design was completed in the 1970s. The building's foundations were laid following a much needed donation, which covered the project's financing, by the great benefactor and president of the Dekozis-Vouros Foundation, Mr Lambros Eftaxias. After a hiatus of some years, construction resumed in 1981. A new governing body was formed, this time with the cooperation of the Greek government, which, through a number of substantial donations, contributed considerably towards completion of the project. This new body is the the Athens Concert Hall Organisation, which has been jointly governed from 1981 to the present day by representatives of the Friends of Music Society and the state. Since it opened its doors to the public in 1991, the Athens Concert Hall has been regarded as one of the most comprehensive culture centres in Europe. Its superb acoustics has been acclaimed both by the public and by renowned performers of the music and art world.The Athens Concert Hall has welcomed and still welcomes top class artists, music ensembles, composers, conductors and performers in an artistic trajectory that has left its mark in the country's culture scene.